But is your nose as long as a telephone wire? Wowee! It's not just your hands which create things which blow me away but your mind, too! Brilliant! Godamnit, I *so* want those shoes. it is a beautiful drawing, i forgive you for the fib... this time. love your shoes! You should send them to a show designer! Might get a commission! Most shoes these days are so yesterday! I'm glad you like it. I do too. I'll let you know when they are available to humans. Cheers, my dears. And, a massive big cheers to all those who have visited and commented and added their names to my 'I'd buy this book' list on my other blog. 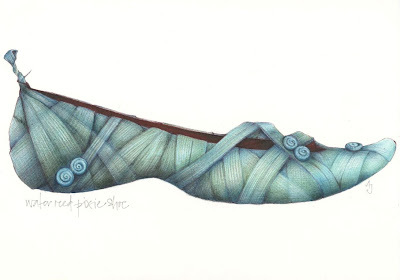 Such a lovely shoe.. unusual and beautifully rendered.